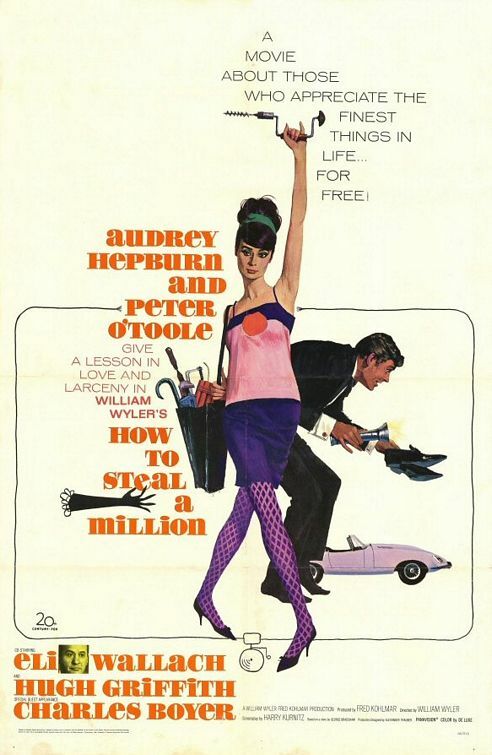 The daughter (Audrey Hepburn) of an expert forger (Hugh Griffith) enlists the help of a man (Peter O’Toole) she believes is an art thief to steal back a forged statue loaned by her father to a local museum. Thirteen years after directing Audrey Hepburn in her Oscar-winning debut performance (for Roman Holiday), William Wyler re-teamed with Hepburn to make this stylish but disappointing Hitchcockian caper flick. The film’s primary flaw is its pacing: at more than two hours long, it simply drags, and takes far too long to get to its most exciting sequences (taking place during the heist in the museum). Once we’re finally there — and our would-be lovers find themselves stuck in a crammed closet, needing to find a way to break free and carry out their plan — the story becomes temporarily captivating, as we watch O’Toole’s character demonstrating immense presence of mind as a thief (even if this isn’t really his “true” identity). Hepburn is as lovely as ever in her palette of Givenchy outfits, but doesn’t bring anything new or interesting to her role; and a sub-plot involving millionaire Eli Wallach’s pursuit of Hepburn simply takes up precious screentime. This one is worth a look by fans of this particular genre, but be forewarned that it doesn’t quite succeed on all counts. No, though it’s worth a look if you’re a fan of Hepburn or O’Toole. A cutesy script directed in a cutesy manner, delivering cutesy performances. Personally I find it rather dull but some will be satisfied with it as light entertainment.